Last fall, I made some homemade applesauce. I thought it was so much better than store-bought. After making that, I decided I needed to try making homemade apple butter sometime. Several friends have given me homemade apple butter the last few years–it makes a wonderful food gift, especially around the holidays. I discovered you can make apple butter with the slow cooker or on the stovetop, and for my first try I decided to make a stovetop version. 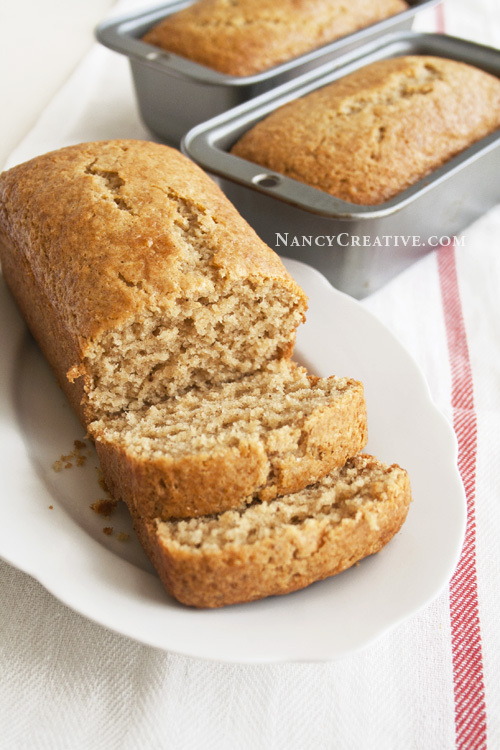 This recipe is really easy and it’s weetened with honey and apple juice or apple cider. You basically just put all the ingredients in a large pot and let it cook on low for an hour, until the apples get all tender and mashable. Then you let the mixture cool a little and puree to a smoother consistency in a food processor or blender. I love the cinnamony taste and I think that homemade apple butter, like homemade applesauce, is so much better than any you can buy! In a large pot or saucepan, combine chopped apples with the rest of the ingredients. Stir well, cover pot, and cook on low for 1 hour, stirring occasionally. Let mixture cool for 15 minutes, then, in several batches, put mixture in blender and puree until smooth (be careful not to overfill your blender or food processor!). Store in jars with tight-fitting lids or airtight food containers and refrigerate for up to one week. This apple butter is great on toast, muffins, biscuits, and scones. You can stir it into plain or vanilla yogurt to flavor it up more, or layer it with yogurt and granola for a breakfast parfait. Have you ever made your own homemade apple butter? Sharing at Meal Plan Monday, Fiesta Friday, Weekend Potluck. This entry was posted in Breakfast/Brunch, Food and Recipes, Fruit, Healthy Eating, Spreads and Dips and tagged apple butter, cinnamon, honey on October 21, 2016 by nancyc. You’re probably wondering what’s up with this pumpkin recipe. I mean, it’s almost spring–a pumpkin recipe? But I still had a can of pumpkin I bought during the holidays that I hadn’t used and I wanted to make these Chocolate Chip Pumpkin Blondies with it. I usually bake with pumpkin in the fall and winter. There are still a few weeks of winter left, so I decided to go for it! I like using dark or semi-sweet chocolate chips mixed with white chocolate chips, but you can also substitute milk chocolate chips for the white. Or use all the same kind of your favorite chocolate chips. This makes a nice big 9 x 13″ pan full of blondies–just the thing for an easy dessert. They’re moist, chewy, and chocolatey with a yummy cinnamon spicy flavor. They’re actually kind of cakey to0–a little more cakey than your typical blondie. If you have an extra can of pumpkin, you should try these out! Preheat oven to 350˚F. Line bottom and sides of a 9 x 13″ baking pan with parchment paper, leaving a little extra to hang over edges (so you can pick up the blondies after they are baked and cooled). In medium bowl, blend the flour, cinnamon, ginger, cloves, nutmeg, baking soda, and salt; set aside. In large bowl, cream softened butter, light brown sugar, and granulated sugar until smooth. Add egg and vanilla, blending well, then add the pumpkin puree, mixing until well blended. Add flour mixture to butter/sugar/pumpkin mixture until all ingredients are blended. Fold in the chocolate chips and chopped pecans, mixing until evenly incorporated in batter. Spread batter evenly in prepared pan. Bake at 350˚F for 35 to 40 minutes, or until toothpick inserted in center comes out clean. Cool blondies completely in pan, then lift out of the pan with the parchment paper edges and cut into squares. Store in an airtight container at room temperature for 3 to 4 days. Note: These blondies bake up nice and puffy, but sink a little while they’re cooling as most blondies do. Since I’m all out of pumpkin now, I guess I’ll resume my pumpkin baking next fall, but I’m glad I decided to make these blondies now. They’re great with a hot cup of coffee or tea (these would also go great with the Chai Tea Latte I recently posted). Have you baked any pumpkin treats the last few months? Sharing at Cookie Plan Monday, Fiesta Friday, Inspire Me Monday, Full Plate Thursday. This entry was posted in Autumn/Thanksgiving, Cookies/Bars/Brownies, Food and Recipes, Seasonal and tagged blondies, chocolate chips, cinnamon, pumpkin blondies, pumpkin puree on March 6, 2015 by nancyc. Egg Nog is one of those foods that signal the beginning of the holiday season. I first noticed it this year in the grocery store about three weeks before Thanksgiving. I usually buy a few cartons during the Thanksgiving and Christmas holidays and pretty much always have some left over after Christmas. Which is great, because it gives me an excuse to bake some egg nog goodies! Like these Egg Nog Mini Loaves, for example. After having lots of super-sweet holiday treats, I was wanting something just a little sweet, and these little loaves turned out to be just the thing! They’re moist, slightly sweet, and have a mild egg nog flavor, so even those who aren’t crazy about egg nog may like them. These mini loaves rise really nicely, too (Note: I also tried making this recipe as a 9 x 5″ loaf, but since it sunk a little in the middle, I think it works best for mini loaves, and probably muffins, too). If you’d like to sweeten these loaves up a little more, sprinkle on a dusting of powdered sugar after they’ve cooled or add an egg nog glaze on top (try the glaze that I used on these Egg Nog Muffins). Preheat oven to 350˚F. Grease and flour three 5 x 3″ mini loaf pans; set aside. In large bowl, whisk together flour, baking powder, baking soda, salt, cinnamon, and nutmeg. In medium bowl, beat eggs, egg nog, yogurt, sugar, butter, and vanilla and rum extracts, blending well. Add this mixture to dry ingredients, stirring just enough to moisten. Pour into prepared mini loaf pans. Bake at 350˚F for 30 to 35 minutes or until toothpick inserted in center comes out clean (I baked mine for 32 minutes). Cool loaves for 10 minutes in pans, then remove to wire rack to cool completely. If desired, glaze with Egg Nog Glaze (click here for the recipe–I’ve used it before on some egg nog muffins). As the holidays wind down, these Egg Nog Mini Loaves are the perfect treat with some coffee or tea. Hope you had an enjoyable holiday and wishing you a safe, healthy, and happy New Year! This entry was posted in Autumn/Thanksgiving, Food and Recipes, Food Gifts, Quick Breads/Sweet or Savory, Seasonal, Winter/Christmas and tagged cinnamon, Egg Nog, egg nog mini loaves, mini loaves, Nutmeg on December 30, 2014 by nancyc.